Hi friends! Letting you know that this post is sponsored by Pacific Foods. I’ll be sharing a recipe with them every month this year as their non-dairy ambassador! Thanks for supporting the brands that make DK possible. 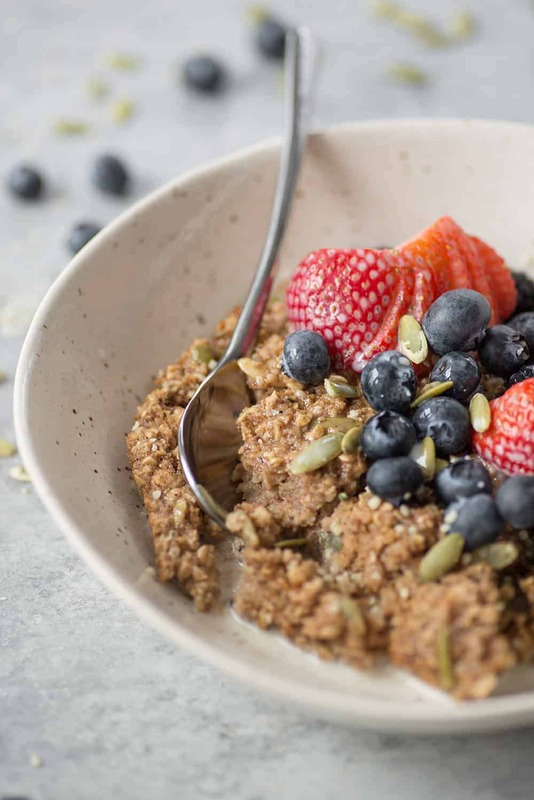 This vegan baked oatmeal is the perfect breakfast for lazy mornings when you want a warm, homemade dish without a lot of fuss. It’s my go-to when I’m serving a house filled with weekend guests; I’ll throw a pan of this in the oven, offer some fresh fruit to go alongside and plenty of coffee. It’s the kind of breakfast that you want to linger around, but healthy enough to enjoy it whenever the mood strikes. I first shared my baked oatmeal recipe years ago as it was the breakfast that we ended up making everyone the morning of our wedding. My attempt at making my mom’s baked oatmeal a little healthier. Her’s is the one I grew up eating; incredibly delicious, but also somehow contains almost an entire cup of sugar and butter. No wonder we thought we loved oatmeal as kids– wouldn’t you if it contained so much of the good stuff? This baked oatmeal is also packed with the good stuff. Well, the good stuff as I see it in my thirties. Hemp seeds, flax seeds, pumpkin seeds, oats, bananas and just a little bit of sugar to sweeten the whole thing up. Baked to perfection; then pilled with berries and more hemp milk for the ultimate contrast in texture and taste. 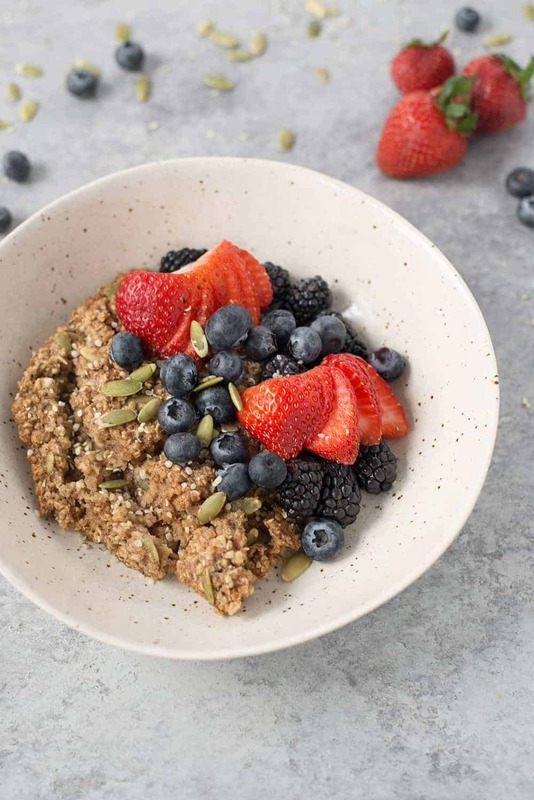 A little bit oatmeal, a little bit cereal, a lot of yummy deliciousness. As Pacific Foods non-dairy ambassador this year, I’m excited to bring you another recipe featuring their incredible line of non-dairy milks. I made a pasta recipe last month featuring their cashew plant-based beverage (that y’all are loving as much as we do!) and now, a super seedy baked oatmeal with their hemp milk plant-based beverage. 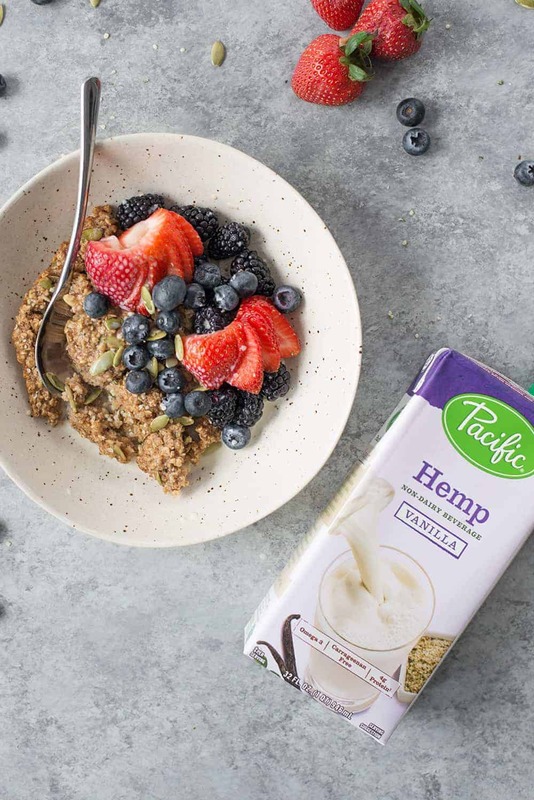 If you haven’t tried hemp milk before, it’s smooth and creamy with a slight nutty flavor. If you like almond milk, then you’ll love hemp milk! I love it as hemp seeds are a great source of plant-based nutrition, including the essential fatty acids omega-6 and omega-3. It tastes great in oatmeal recipes like this one, smoothies, cereal and baked goods. 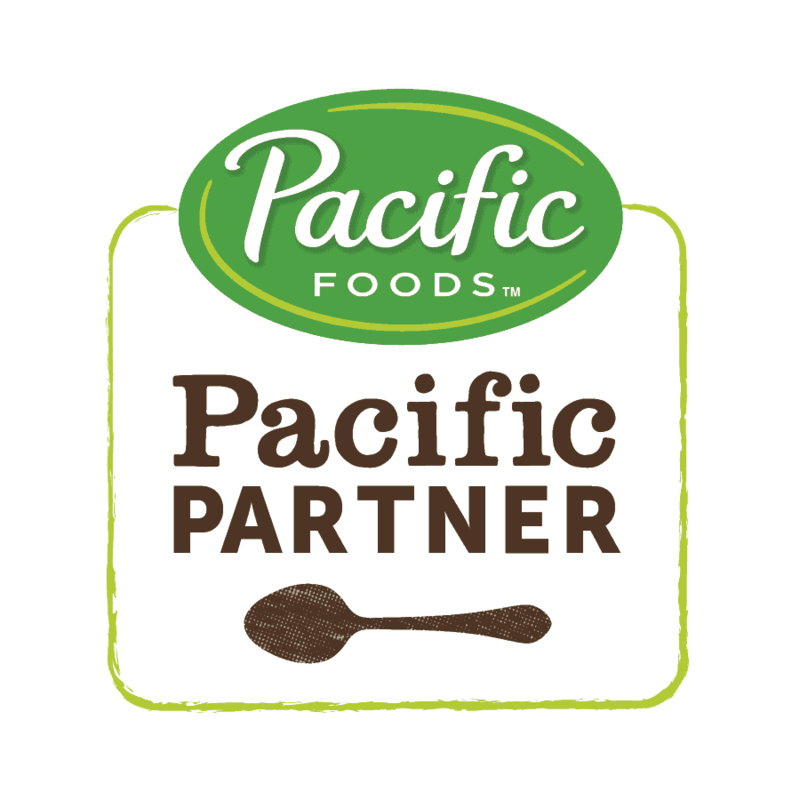 You can find Pacific Foods non-dairy beverages in most well-stocked grocery stores in the pantry section; I usually grab them at Whole Foods or online. Are you shopping for groceries online? I find myself doing it more and more often, especially with great services like Thrive Market and Instant Cart. Every time I do it, I’m reminded of the movie Wall-E, but I’m addicted to the convenience of it. Though, Vander does loves the grocery store as much as his mama; I usually wear him when we go and he thinks grabbing things off the shelf is so funny. I let him hold the produce as I grab it, another game we play. I can’t wait for you to try this one. It’s especially perfect if you’ve got any Mother’s Day brunches coming up (cough, BL, cough) as it’s easy to make ahead. If I plan on serving this the next morning, I’ll assemble everything in the glass baker and let sit in the fridge overnight. Then, I’ll pop it into the oven the next morning. Don’t forget the berries! They really make it. And, one more thing- don’t be tempted to omit the banana. It almost caramelizes as it cooks and adds such wonderful flavor to the baked oatmeal. 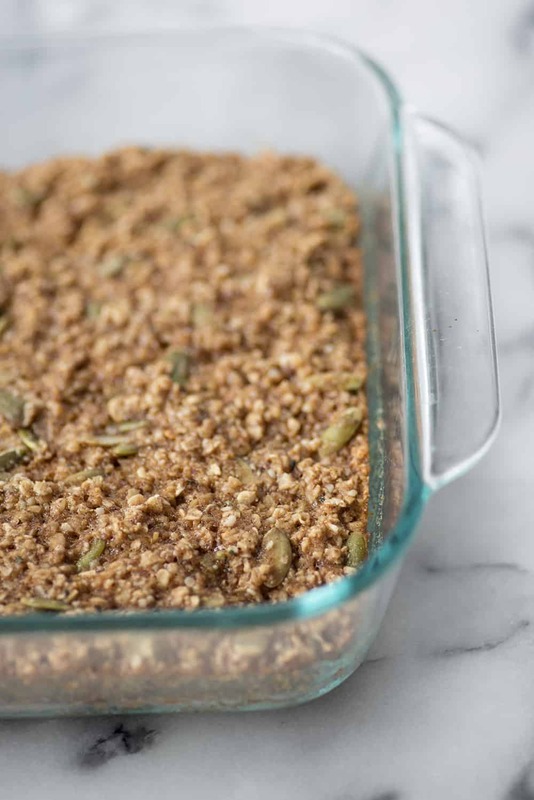 Vegan Baked Oatmeal Recipe! 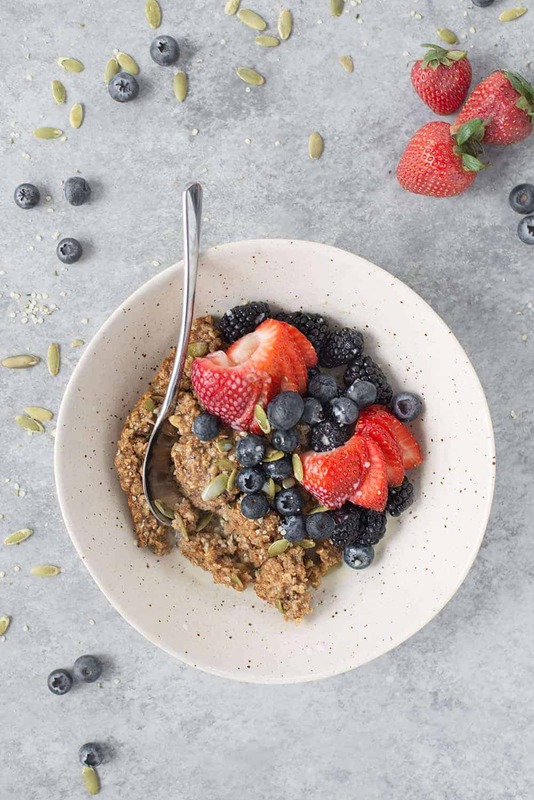 Super seedy baked oatmeal with hemp seeds, flax seeds and pepitas. Vegan and gluten-free. Preheat oven to 350 degrees F. Lightly spray an 8 inch square pan with non-stick spray. Whisk together the ground flax seeds and water in a small bowl, then set aside to gel. Slice banana and place in a single row on the bottom of the square pan. In a separate bowl, mix together the oats, brown sugar, cinnamon, ginger, nutmeg, baking powder and salt. Add the flax seed mixture, hemp milk, maple syrup, vanilla and coconut oil. Stir together, then fold in the pepitas and hemp seeds. Gently top the sliced bananas with the oat mixture. Place in the preheated oven and bake for 30 minutes until golden brown and set. 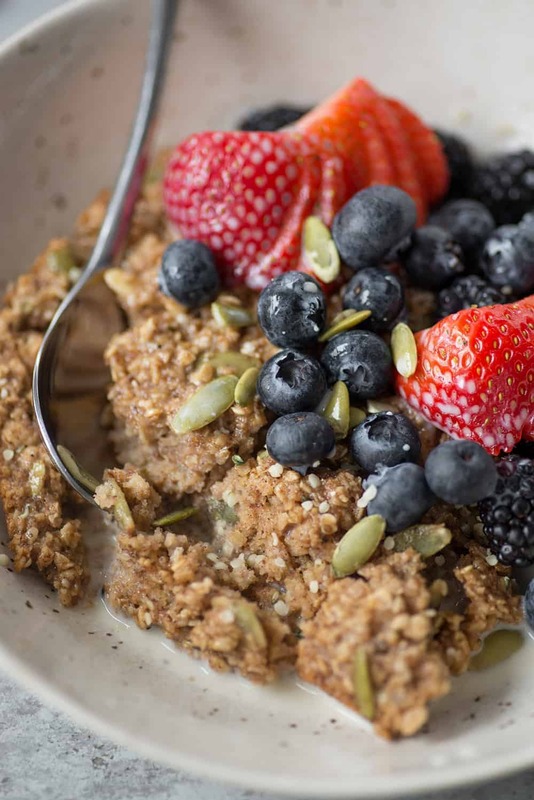 To serve, scoop the baked oatmeal into a bowl and top with fresh berries and more hemp milk. Disclaimer: this post is sponsored by Pacific Foods. I’ll be sharing a recipe with them every month this year as their non-dairy ambassador! Thanks for supporting the brands that make DK possible. This was delicious! I subbed almond milk for the maple syrup and it was sweet enough for us. I added blueberries to bake. Should leftovers be refrigerated after baking? Thanks!